This delicious palate cleanser will let the flavours in the dish sing. It has mineral and slatey aromas and a vibrant palate of lime and lemon. 1. Preheat the oven to 200°C. Line two oven trays with baking paper. Rinse the rice well. Put in a large saucepan with the water, cover and bring to a simmer over medium heat. Reduce heat to low and cook for 12 minutes or until tender, and the water has been absorbed. Turn off the heat and stand covered for at least five minutes. 2. While the rice is cooking, finely chop the spring onion and garlic. Peel and finely grate the ginger. Put the pork, breadcrumbs, garlic, ginger, sesame oil, egg, salt (½ tsp.) and three-quarters of the spring onion in a large bowl. Mix until well combined. 3. Using wet hands, shape the pork mixture into four cm balls and place on one of the lined trays. Cut the broccoli into florets, then place on the second tray. Drizzle broccoli with two tsp. of oil and season with salt and pepper. Toss to coat. Roast broccoli for 15 minutes or until starting to brown, turning halfway through. 4. Meanwhile, heat the remaining oil in a large frypan over medium heat and cook meatballs, in batches if necessary, turning them for five to six mins until lightly browned. Return to the lined tray and bake in the oven for five to six mins until cooked through. 5. Meanwhile, wipe the frypan clean with a paper towel. Add the miso paste, butter and honey to the pan over medium heat. Add the corn kernels, stir to combine and cook. Season with pepper and remove from the heat. 6. Add the broccoli and meatballs to the corn mixture and stir to combine. Divide rice among bowls and top with the meatball mixture. Scatter over the remaining spring onion and drizzle with the ponzu sauce. A Japanese rice-lager is great to cut through the spicy and salty flavours in this dish. It’s crisp and refreshing, with a slight bitter note for extra balance. 1. Trim the leek, discarding the dark green part, and rinse well. Halve lengthwise and thinly slice. Thinly slice the spring onion, keeping the green and white parts separate. Rinse and drain the corn. Put the stock cubes and one litre (four cups) boiling water in a heatproof jug and stir until dissolved. 2. Heat two tsp. vegetable oil in a medium saucepan over medium-high heat. Cook the leek, stirring, for four to five minutes until softened. Stir in the corn, then transfer the mixture to a large bowl and cover to keep warm. Wipe out the pan with a paper towel. 3. Heat two tsp. vegetable oil in the pan over medium-high heat. Cook the pork, breaking up with a wooden spoon, for three minutes or until browned. Stir in the chilli and garlic sauce, then cook for a further one minute or until fragrant. 4. Bring a separate medium saucepan of water to the boil for the noodles. Add the pork mixture to the leek mixture in the bowl, toss to combine, then cover to keep warm. Reserve the saucepan. 5. Put the stock, two tsp. soy sauce, two tsp. sugar and the white part of the spring onion in the reserved saucepan and bring to the boil. Reduce the heat to low, then add the sesame oil and miso paste, and stir until dissolved. 6. Meanwhile, cook two bundles of the noodles (reserve remainder for another use) in the pan of boiling water for four mins or until al dente, then drain. Divide the noodles among bowls, top with the pork and leek mixture, then ladle over the soup. Scatter with the sesame seeds, green parts of the spring onion and shichimi togarashi to serve. 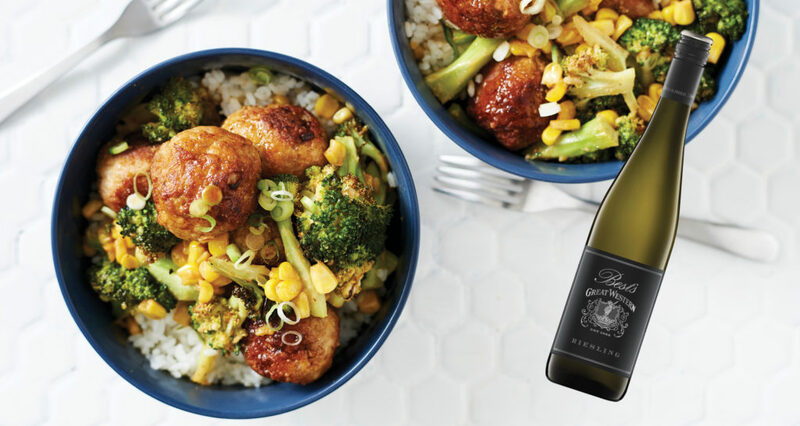 You can’t go wrong with a delicious chardonnay and chicken, and this wine is certainly that. It has flavours of toasty oak, grapefruit and a hint of lemon curd richness, followed by a crisp finish. 1. Thinly slice the cabbage and finely shred the cucumber, then place in a bowl and mix in the salt until very well combined. Set aside to wilt and lightly pickle. 2. Meanwhile, combine the Korean BBQ paste with the oil in a large bowl, then add the chicken and mix until well coated. Peel and finely grate the ginger. Crush or finely chop the garlic. 3. Rinse the cabbage mixture in a sieve under cold running water and drain well. Combine the cabbage mixture with the ginger, garlic, sugar and soy sauce in a bowl, mixing until very well combined. Cover and set aside for 15 minutes to allow the flavours to infuse. 4. Meanwhile, thinly slice the chilli, removing seeds if less heat is preferred. Coarsely chop the coriander, including the stems. 5. Heat the oven grill to high and line an oven tray with foil. Place the marinated chicken on the tray and grill for two to three minutes each side until cooked through and golden. Rest for three minutes. Meanwhile, stir the chilli and coriander through the kimchi to combine. 6. Cut the buns in half and grill cut-side-up until lightly toasted. Spread one side of each bun with mayonnaise, then top with the chicken and kimchi. Serve any remaining kimchi on the side. You don’t want to overpower the flavours in this dish, but at the same time, tofu gives more room to play around with flavour. A light to medium-bodied pinot noir works perfectly in this case, and this wine is packed with juicy sour cherry and earthy flavours. 1. Put mushrooms in a heatproof bowl. Cover with the boiling water. Stand for ten minutes or until softened. Strain, reserving mushroom stock. Rinse rice. Put in a saucepan with the water, cover and bring to a simmer over medium heat. Reduce heat to low and cook for 12 minutes or until tender and water has absorbed. Turn off heat and stand, covered, for five minutes. 2. While the rice is cooking, combine the rice wine vinegar, half the sugar and a pinch of salt in a small saucepan over medium heat. Cook for 30 seconds, stirring to dissolve the sugar. Remove from heat. Cut the cucumber and carrot into thin matchsticks, then put into a bowl, pour over vinegar mixture and toss to coat. Set aside to pickle. 3. Halve the zucchini lengthwise, then thinly slice into half moons. Thinly slice the capsicum, discarding the seeds and membrane. Thinly slice the spring onion, separating the white and green parts. Carefully remove the tofu from the packet, drain and pat dry with paper towel, then cut into three cm cubes. 4. Combine the soy sauce, mirin, vegetarian stir-fry sauce, remaining sugar and the reserved mushroom stock (½ cup) in a bowl. Remove the mushroom stalks with a sharp knife, discard, then thickly slice. 5. Heat the oil in a large frypan over medium-high heat. Stir-fry the white spring onion and capsicum for two minutes, then add the zucchini and stir-fry for a further two minutes. Stir through the tonkatsu sauce until combined and warmed through. Transfer the stir-fried vegetables to a bowl and cover to keep warm. Wipe pan clean and reserve. 6. Put mushrooms and braising sauce in reserved pan. Bring to the boil. Reduce heat to a simmer, then carefully add tofu. Cook, covered, for three minutes or until warmed through. Drain pickled vegetables. Fluff up rice and divide among bowls. Top with stir-fried vegetables, tofu mixture, green spring onion and sesame seed mix. Serve with the pickled vegetables. This might not be the first wine that springs to mind, but trust us, a juicy, fruity rosé is a mean match for a curry. From France, this wine has a whiff of smoke on the nose, fruit sweetness on the palate, and some strawberry and vanilla. And it won’t break the bank. 1. Put one litre (four cups) water in a medium saucepan and bring to the boil for the rice. Meanwhile, cut the cauliflower into small florets. Peel and remove any seeds from the pumpkin and cut into two cm chunks. Coarsely chop the coriander, including the stems. 2. Add the rice to the pan of boiling water and cook for 12 minutes or until tender. Drain in a sieve. Set aside and keep warm. 3. While the rice is cooking, heat the oil in a large, deep frypan over medium heat. Add the curry paste and stir for one minute or until fragrant. 4. Stir in the cauliflower, coconut milk, tomatoes and 60ml (¼ cup) water. Season with salt, cover with a lid and cook for five minutes. Add the pumpkin, cover again and cook for a further five minutes or until vegetables are tender. 5. While the curry is cooking, remove the central vein from the kaffir lime leaf, then using a knife, finely shred. Put the shredded coconut, coriander and salt in a food processor and pulse until well combined. 6. Stir the peas into the curry and cook for one minute or until warmed through. Season to taste with salt. Divide the rice among bowls and top with the curry and sambal to serve. COOKING TIP: Including coriander stems add texture and flavour to the sambol, while eliminating waste.